Features and Benefits Roomy messenger bag in a durable, stain-resistant nylon provides plenty of space for all the essentials. Adjustable strap for customized drop length is also reversible for a different look Completely removable internal parts, so the bag can be used long after mom’s done pumping Removable work surface provides a clean place for mom to work with Color-coordinated cooler bag keeps milk cool for 12 hours Two mesh storage bags designed to hold loose pieces and parts in between pumping sessions IMPORTANT: This product is a single user item. Use by more than one user may pose a health risk, performance questions, and voids the warranty. 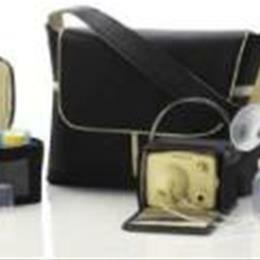 Chosen for you and your baby - All parts that come into contact with breastmilk are BPA/DEHP Free.